When we think of dungeon delving games, I’m sure that the first thing that would come to the minds of most people, even non-gamers, is Dungeons and Dragons. Designed by Gary Gygax and Dave Arneson in 1974, Dungeons and Dragons is the father of all tabletop role-playing games. D&D was the first role-playing game and it is still considered to be one of the most popular. It gave rise to a variety of other role-playing games, but it also popularized the dungeon delving theme. There is a vast number of great games where you play as adventurers exploring a dungeon in hunt of treasure and other riches and I’m going to talk about some of the games we have available in the café! In addition, most of these games will be featured at our Dungeon Delving Event on Saturday, September 30. Created in 1975 by Gary Gygax and some others, Dungeon! is a game directly inspired by Dungeons and Dragons as the idea was essentially to take D&D and translate it to a board game format. The board is a dungeon consisting of hallways and rooms. Players choose a character class with different abilities then move through the dungeon, fighting monsters and collecting treasure. Instead of working together like in D&D, players are competing to be the first to emerge from the dungeon with their treasure. 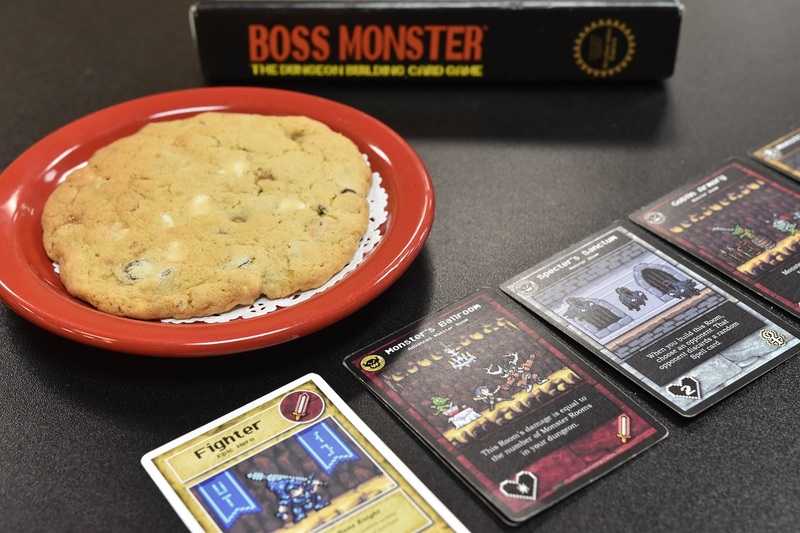 Boss Monster is a game reminiscent of classic side-scrolling video games. The box is even designed to look like the art on old NES cartridges and the art on each card is pixelated, just as these old games were. You play as the monster at the end of the dungeon, AKA the “boss” that adventurers need to fight in order to escape with their treasure. You then build rooms in your dungeon designed to attract different types of adventurers and wear down their health. Each adventurer that perishes in your dungeon gives you more points towards winning. If they make it through to the boss, they count against you as a wound. The strategy of the game comes in when trying to balance luring adventurers quickly, but also making sure your dungeon is strong enough to defeat them. Clank! is a game that has been extremely popular recently. I finally got a chance to play it after hearing about all of the hype and I loved it! It definitely lives up to its glowing reputation. For those who don’t know, Clank! is a deck-building game with the unique added board mechanic. 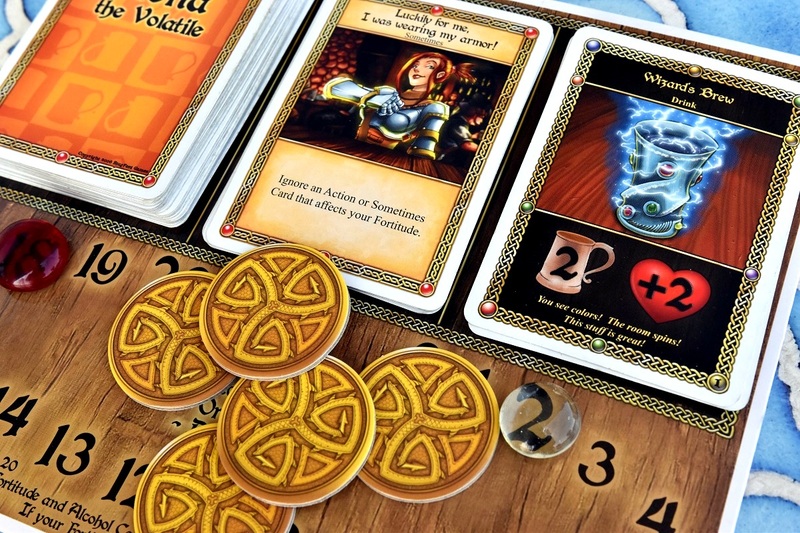 If you haven’t played any games of the deck-building variety, you ought to check one out. Every deck-builder starts with the same basic mechanics. Each player is given the same starting cards which becomes the base of their deck. These cards help you buy more cards from an open display that you can add to your deck. Each card that you purchase should make your deck stronger and help you get closer to winning. Typically, winning means having a certain number of victory points. What makes Clank! unique is that, in addition to buying cards to build up your deck, there is an adventure theme built into the game that you don’t see in other deck-builders. A big part of Clank! is the board depicting a dragon’s hideout beneath a castle. Players journey through the castle to collect treasure, trying to make it out alive. Each treasure that you take makes the dragon angrier and every careless noise you make turns you into a bigger target for the dragon’s rage. Use the cards that you have added to your deck to help you move through the dungeon and fight monsters. The player who makes it out alive with the most treasure is the winner! 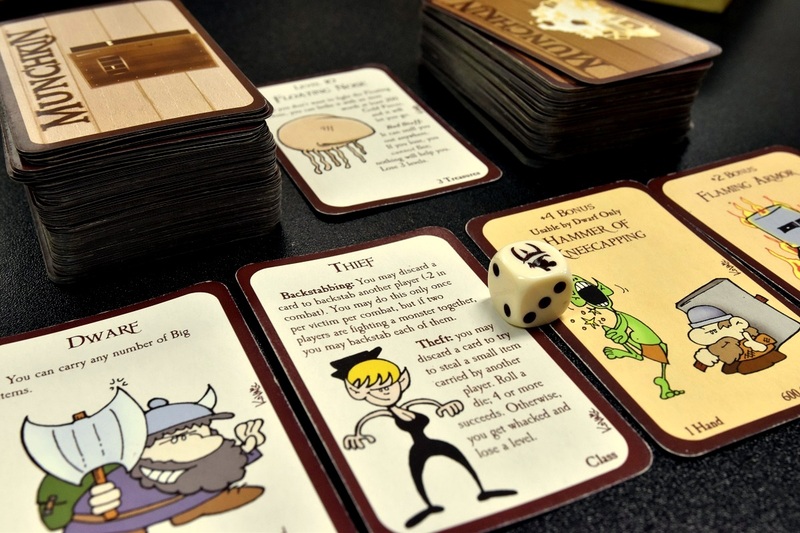 Munchkin is meant to be a satirical take on traditional role-playing games. Steve Jackson Games basically took the usual tropes of these types of games and turned them on their heads. This makes for a ridiculous, but really fun gaming experience. In Munchkin, players all start at level 1 and are competing to be the first to level 10. You can customize your character by playing race and class cards, then equipping your character with weapons. One of the mechanics that make the game so silly is that your character is subject to change at any time, which can be frustrating if you have cards that only one type of race or class can use. On your turn, you “kick down” a dungeon door and deal with whatever is behind it. Typically, that thing is a monster that you have to fight. If you successfully defeat it, you can gain treasure. Sometimes it will happen that you are not strong enough to defeat the monster. This is where one of the really fun mechanics of the game comes in where you can negotiate with your opponents to get them to help you out. Of course, you will probably end up later stabbing them in the back. All in all, Munchkin is meant to be a fun game in which you shouldn’t take yourself too seriously. The next game is one in our breadstick section. 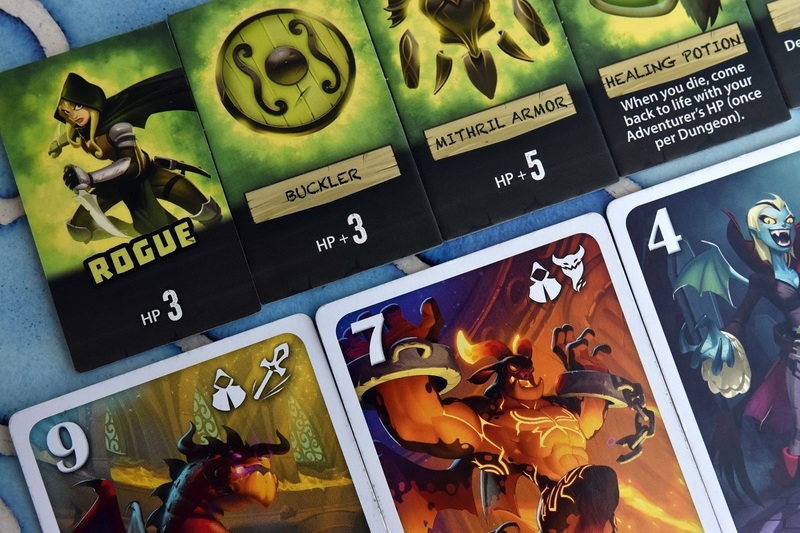 Welcome to the Dungeon is a press your luck type of game in which players bid to be the one to enter the dungeon and fight the monsters. The problem is, you don’t know what monsters are waiting for you and it’s possible that you will lose precious equipment before entering. 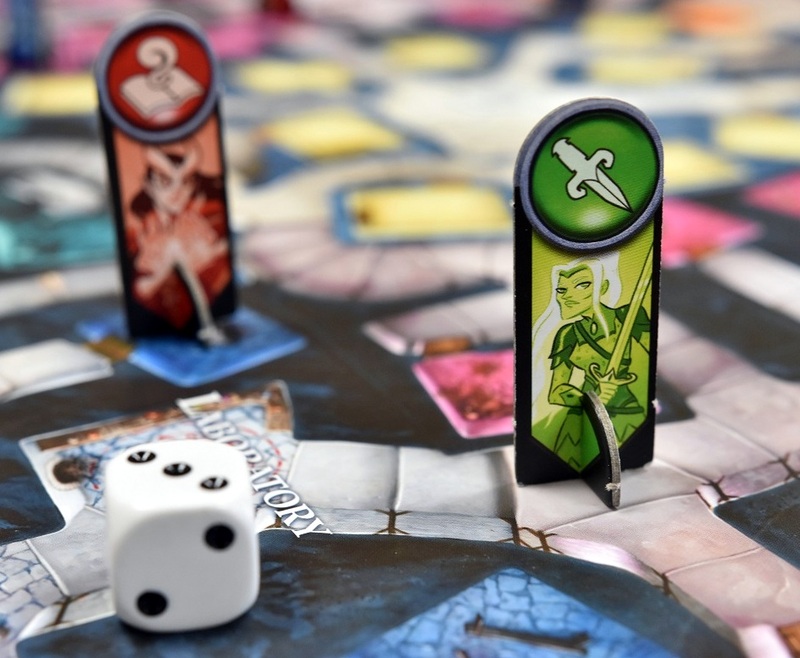 During the first phase of each round players bid by drawing cards, then choosing to either add it to the dungeon pile, or discarding it along with a piece of equipment so that the hero can’t use it when entering the dungeon. Instead of bidding, you can choose to pass and will not be able to enter the dungeon. The last player left in this round moves on to phase two where they have to battle each monster that was placed in the dungeon pile. 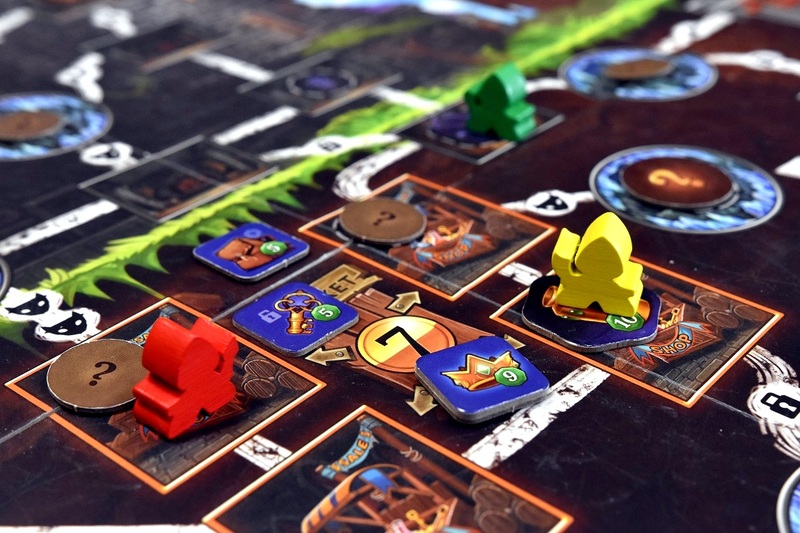 The fun of Welcome to the Dungeon lies in the bidding phase where you have to decide if you want to take on the dungeon or not. If you don’t, it then becomes a matter of trying to sabotage whatever player ends up entering. If you do want to take on the dungeon, you have to hope that your opponents don’t sabotage you too badly. The first player to successfully make it through the dungeon twice is the winner, or you can be eliminated by dying in the dungeon twice. 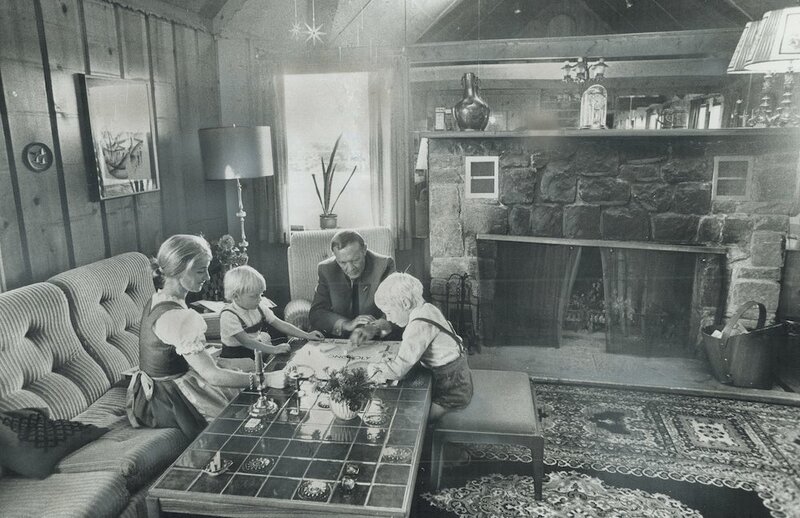 The final game is rather different from the others because instead of taking place during the dungeon adventure, The Red Dragon Inn takes place after. You and your companions have made it out of the dungeon with your loot and are looking to relax and have some fun at a local tavern. Of course, I’m sure you can imagine that a celebration of a group of adventurers coming back from a successful journey can get a little rowdy. At its heart, The Red Dragon Inn is a drinking game, except players aren’t drinking, their characters are. Over the course of the game you will be drinking your own drinks, buying drinks for your friends, and maybe even starting a round of gambling. If you run out of gold or pass out drunk, you lose. The last player left who is still sober enough to be conscious is the winner. If you want to check out any of these games or one of our other Dungeon games, we’ll have most of them available at our Dungeon Delve Day, which you can read more about on Facebook. We also recently added a new game, Delve, to our library that will be featured at this event!